Are you looking for a new way to shove an entire wheel of brie into your face? Good. You came to the right spot then. Let’s chat about this for a second. A couple weeks ago when we were in Tahoe, Adam went to the store searching for cedar planks to grill his famous salmon on (have you tried his salmon yet?! You need to). And while we couldn’t find any planks that were large enough to fit a piece of fish, we found the cutest little mini cedar planks that were just perfect for grilling cheese. Brie cheese, to be exact. Now, I’m not going to toot my own horn or anything, but I’m pretty proud of my brown sugar baked brie. Okay, fine—it’s my mom’s brown sugar baked brie. But a couple years ago, I made it for a group of people and I am pretty sure that brie won over Adam’s heart. I had just met him the day before and was in charge of making an appetizer and a side for the dinner we were hosting together (long, slightly weird story, read this post and try your best to ignore my awful photos and bold font). I’m not sure where exactly I am going with this one, except for the fact that I truly believe my brown sugar brie cheese prompted Adam to fall deeply in love with me. Okay, maybe not “deeply in love” but you know it’s true—the best way to a man’s heart is through his stomach! Amen. That’s my brie story and I’m sticking to it. I’m going back now to the original story. This grilled brie. We made it in Tahoe and LOVED it. 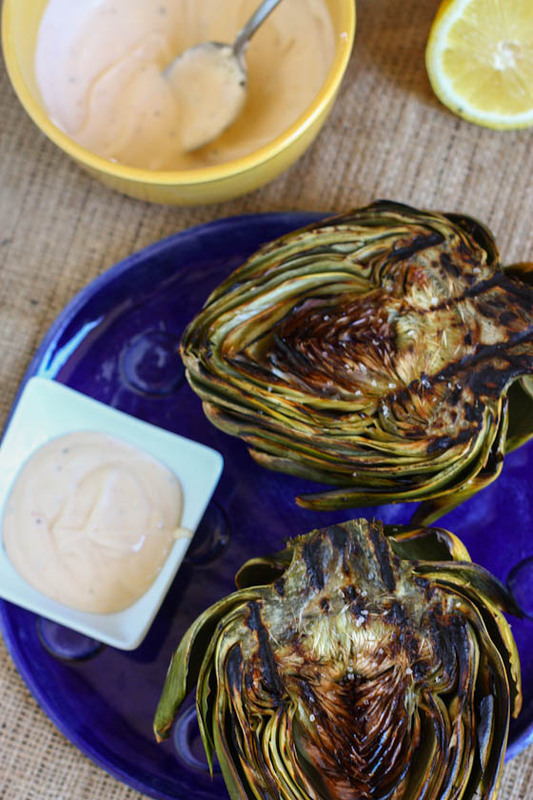 Such an easy, delicious appetizer served hot off the grill and absolutely doused with honey and trail mix. We used trail mix in Tahoe because that’s all we had and so that’s how I recreated it at home. 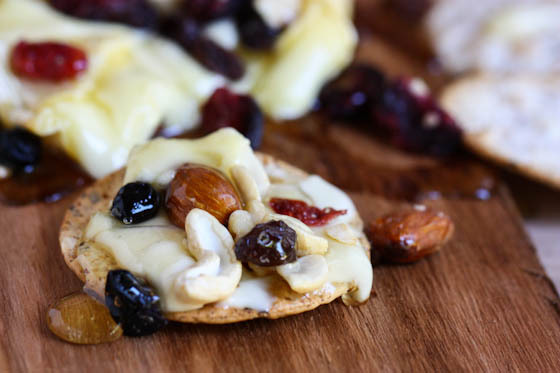 I love the bits of the honey glazed dried fruit and nuts on top of the runny, hot brie. It just works. 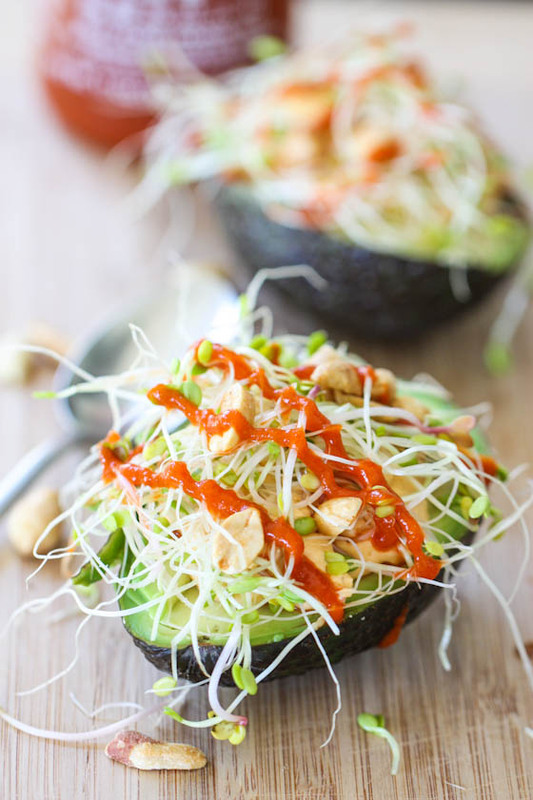 This would also make a great camping meal or snack! You can pre-soak the cedar plank, pack it up with you and then just set it (with the cheese) right over your fire pit on the grates. Just make sure bears don’t get your extra honey! P.S. You can find cedar planks near the meat department at most major grocery stores. 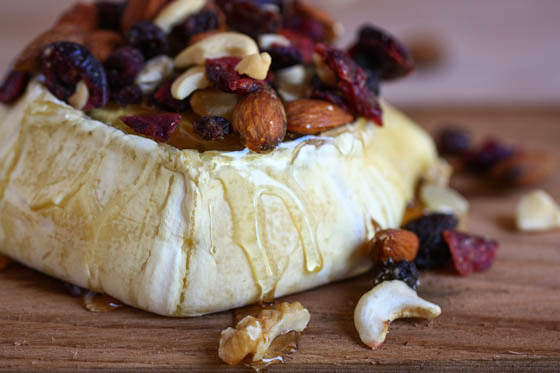 P.P.S If grilling scares you (or if you just don’t have a grill), you can bake this brie without the honey and trail mix at 350 for about 15 minutes until hot and gooey. P.P.P.S I suggest making this for a cute boy. You never know what might happen as a result! Soak your cedar plank in cold water for 30 minutes prior to using. This will ensure it won’t burn! Next, preheat your grill to medium/high (about 400 degrees). Place your brie wheel on your plank and place on the grill. Close grill and cook for 10 minutes, until cheese is practically bursting at the sides. Immediately after pulling off the grill, sprinkle trail mix and honey over. Serve with crackers. I just bought cedar planks yesterday to grill salmon! I can’t wait to do it hopefully this weekend. Brie looks awesome and I never thought about grilling it! Forget the bikini, I need to have this in my mouth! I think I started drooling after seeing the first picture. I need to find a cute boy to make this for pronto, obviously. 😉 I’m convinced! I just recently saw a recipe for baked brie with honey and figs that looked great. I love the addition of some crunchy trail mix as well. Going to try this soon! You can’t beat brie… ever. Love the idea of grilling it on cedar planks! mmmm warm brie is the best! grilling it on a cedar plank? genius. A different kind of ‘grilled cheese’! 😉 I like the looks of this. You had me at your first picture! This looks like a dangerously good ap to be hanging around the house! So creative! I never would have thought to grill cheese. Brilliant! 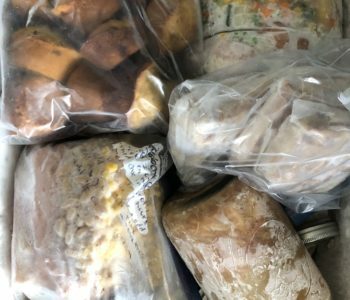 I used to work at a boutique, and in the same shopping center was a cafe that had baked brie with slices of pears and bread. I’m not going to say how many times that was lunch/dinner, but it was a lot. I really love that stuff. This looks so incredibly delicious. My mouth is watering. i think i like the way you guys camp. if i can eat grilled brie while camping, then maybe i’ll tell my husband we can give it a go! Ha, I need to go read that brie story now! This looks delicious!!! 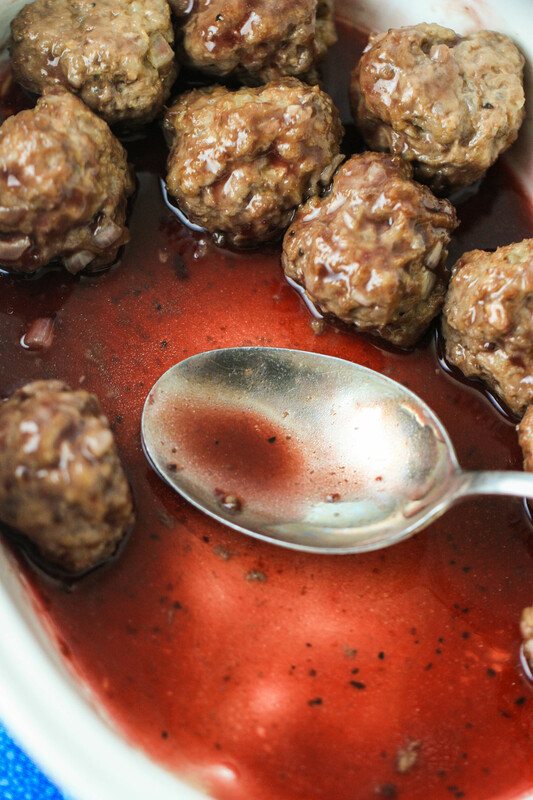 Oh my gosh, this looks ridiculously decadent and so delicious! I must, must make it! Oh Jenna, this looks so delicious! 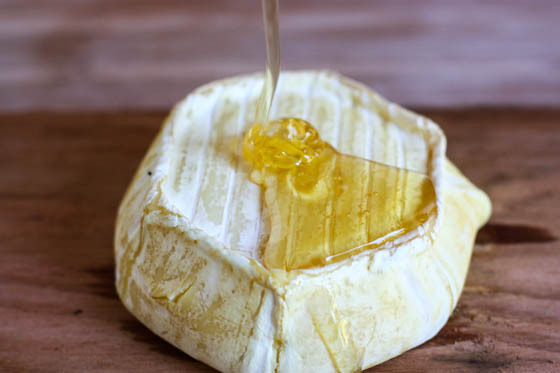 I have had phyllo dough wrapped brie before with honey… and can only imagine how much more awesome it would be with all those nuts and dried fruit. P.S. The picture of Adam drinking wine out of the bottle is classic! P.P.S. The way to a man’s heart is indeed through his stomach! 🙂 I can testify to that. And I thought cedar planks were just for salmon. Super cute boy story, too! 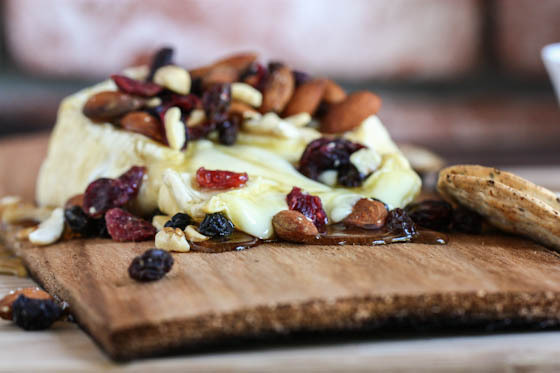 Warm brie in any form is food from heaven – and grilled with honey and trail mix…I am wishing I had a grill right now!! OMG! That made my brain quiver with excitement! I need to eat this tonight! Thanks for posting! OH, that looks GOOD! I love brie! Are you kidding me? This is pure heaven. Love Brie and with trail mix on top it’s just plain dangerous. Ok I HAD to click on the link just to see your original picture of the brie 🙂 you’ve really grown as a photographer and it motivates me to keep working at it! Great recipe, I never thought to grill brie but it sounds amazing! Oh how I miss brie. It’s one of the only few bad things about being pregnant. That and no lox. Sniff sniff. This sure does look tasty though! 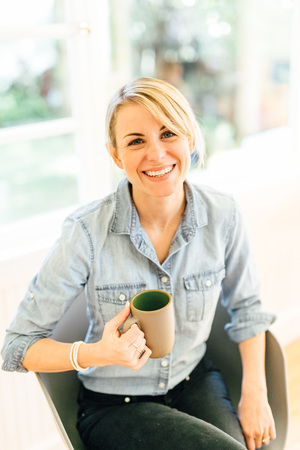 love your brie story! this looks delicious and suddenly wanting a spoonful of honey. great photos. This looks AMAZING! Definitely going to do this for a girl’s night. I love baked (or grilled) Brie. Sometimes I serve it with gingersnaps instead of crackers. It’s a great taste combination and something a little different! Thanks for the great recipe. Salmon and brie on the grill. Yes, please. 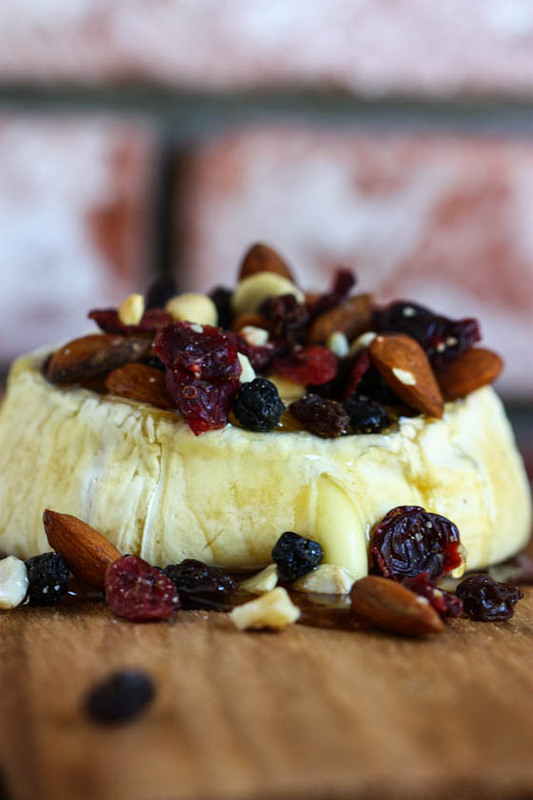 This Ooey gooey brie looks amazing with the honey and trail mix. How perfect for a camping trip and the trail mix doing double duty. i’m going to have to check my grocery store for cedar planks! oh be still my heart. so delicious. This may be a silly question but this is the 1st I’ve heard of cedar planks, would you still use it if baking the brie? I remember reading that post years ago. That’s how I found you was the Murphy Goode contest. Been with you ever since girl. Isn’t it crazy how you found love through that experience. I can’t wait to read your book. Keep up the good work. That looks so delicious! and EASY! Even I can’t mess that up….I don’t think, lol.